NASA's shuttle External Tank 119 (ET-119) is hoisted into vertical position as engineers prepare to mate it with its solid rocket boosters for NASA's STS-121 mission. The tank will lifted into high bay 3 for stacking with solid rocket boosters. CAPE CANAVERAL - NASA aimsto start connecting a redesignedexternal tank and two rocket boosters today while managers consider datathat shows extra safety modifications might be needed before the agency's nextshuttle flight. But any additional work onthe tank, if required, can be completed in time to launch Discovery on NASA'ssecond post-Columbia test flight in early July, agency officials say. "We've already bookedfive to seven days for those activities if we decide they are necessary,"said Kyle Herring, a spokesman for Johnson Space Center in Houston. "Wecan accomplish any additional work and still meet the schedule we've laid outfor July 1." A decision on whether toorder up extra work could be made as early as Thursday. 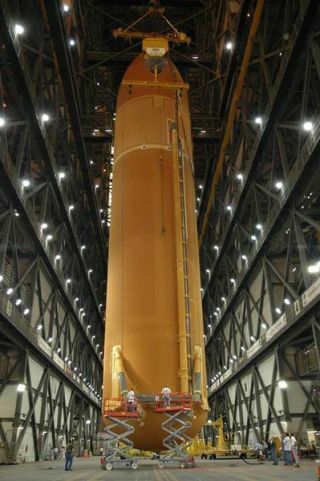 NASA took a big step towardlaunch Monday as crane operators hoisted the 154-foot-long tank off a transporterin the Kennedy Space Center Vehicle Assembly Building. After carefully lifting thetank into a vertical position, the technicians were ready to ease it betweentwo 149-foot solid rocket boosters already stacked on a mobile launcherplatform. Mechanical connections werescheduled early today. Electrical connections will follow over the next 17days. The mating operation"is a critical milestone to launch in early July," KSC spokeswomanJessica Rye said. "It's always nice to have all the hardware here atKennedy and to start assembling a shuttle." The orbiter Discoveryremains scheduled to move May 12 from its hangar to the assembly building,where it will be connected to the tank and its attached boosters. But first, NASA managersmust decide whether to modify foot-long segments of foam insulation designed toprevent ice from building on metal brackets that hold fuel pressurization lineson the outside of the tank. Some managers propose toreshape the "ice-frost ramps" to reduce the amount of foam that couldbe shed from them during flight. Wind tunnel test results have been mixed. In one series of tests,foam broke free from a reshaped ice-frost ramp on a mockup at the Air Force'sArnold Engineering Development Center near Tullahoma, Tenn. Insulation also was lostduring separate tests of ice-frost ramps identical in design to those on thetank being readied for Discovery's flight. But the amounts were consideredwithin allowable limits -- that is, not large enough to cause catastrophicdamage. Slight modificationssubsequently were made to the reshaped ice-frost ramps, and more tests wererun. The results in those cases were encouraging, Herring said. The tests are part of aneffort to eliminate sources of foam debris large enough to down an orbiter. The 2003 Columbia accident wasblamed on foam debris, and a largepiece of insulation nearly struck Discovery after launch in July. The Discovery debris camefrom a 38-foot foam ramp (11-meter) thatserved as a windshield for fuel pressurization lines and electrical cabling onthe outside of the tank. Wind tunnel tests are being conducted to make sure theshuttle can be flownsafely without it. Engineers remain concernedthat ice-frost ramps such as those on Discovery's tank might be susceptible tointernal cracking when supercold propellants are loaded into it. Such defectscould weaken the ramps and make it more likely they could pop off in flight. Any extra work onDiscovery's tank likely would be done in the assembly building between May 2and May 9, Herring said. Discovery still isscheduled to move out to its launch pad May 19. A fuel-loading test istentatively scheduled for June 1, but managers still haven't decided whether toconduct it. The test would enableengineers to see whether replacements for suspect fuel-depletion sensors in thetank work properly. It also would subject the tank's foam insulation to super-coldtemperatures that could cause internal cracks. A decision on whether toproceed with the test is expected in early May. Discovery remains scheduled forlaunch during a window that will extend from July 1 through July 19. Publishedunder license from FLORIDATODAY. Copyright ? 2006 FLORIDA TODAY. No portion of this material may bereproduced in any way without the written consent of FLORIDA TODAY.